Today’s Real Food Reality Tip: Have fun playing with recipes, making them work for your family’s real food tastes and needs! 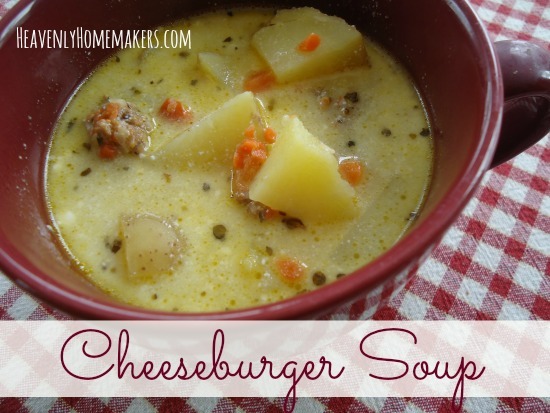 For instance, our family has fallen in love with this Cheeseburger Soup recipe. I have been making it once a week for the past few weeks. To keep life exciting (because clearly, not much exists in life that is more exciting than soup in a bowl) – sometimes I substitute the potatoes in the recipe with whole wheat or brown rice pasta. It is delicious this way! Plus, dumping in noodles saves me a few extra minutes if I don’t want to take the time to prepare potatoes. 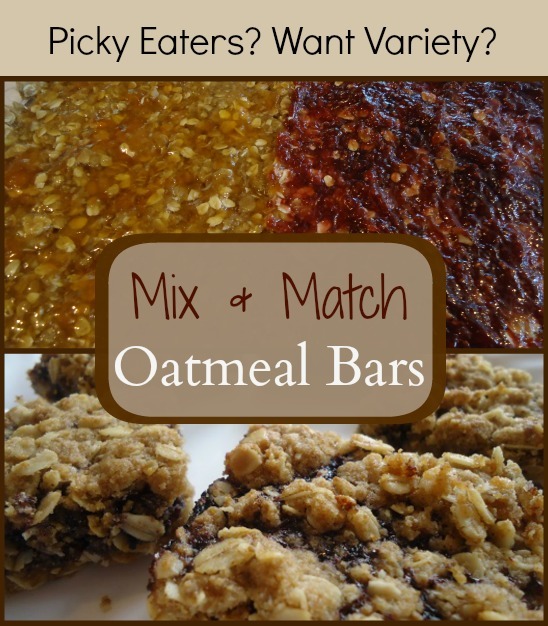 I’ve also shared that sometimes I make our Raspberry Oatmeal Bars with different varieties of jelly. It’s fun to take basic, favorite recipes and play with them to add variety without adding extra work! Do you like playing with recipes or do you prefer to follow a recipe precisely? I do quite a bit of changing up of recipes, too. I don’t want to write off a recipe just because it contains an ingredient that we are not crazy about or are overbudget. Sun-dried tomatoes are not popular here and neither are mushrooms. It also depends on what needs to be used up in my pantry or refrigerator. We had a large pork roast for lunch today so I will be freezing some of those leftovers for pork and noodles later and using the rest over the next few days. I hope to make Cuban sandwiches tomorrow for lunch. Have you thought of making the quick mix biscuits and mixing in garlic powder and cheese and dropping them by tablespoonfuls on a baking sheet and making garlic cheese biscuits? Thanks for the great mix. Thanks for the soup recipe. We were looking for something like that. I see spaghetti squash on your menu and wanted to give you a recipe that we love. Bake the squash and shred it into noodles. Cook 1 lb. of hamburger meat with crushed garlic clove and add to the squash. Beat 3 eggs and add those to 12 oz of pizza/pasta sauce. Mix all ingredients together. I like to add pepperoni and then top it with cheese. Bake for 40 minutes at 350. When do you bake all the muffins and breads on your menu? Do you make them the night before, the morning of, the weekend before or some massive baking day in the past and pull them out of the freezer? I had time this evening and was in the mood so I made 2 loaves of applesauce bread and a pan of strawberry bars. Your menu looks yummy. :-) I usually follow recipes, but will sometimes play around with them, especially after I have made them once. I am amazed at how involved your lunches are. Our lunches are actually pretty simple to put together – especially since I get my boys in there helping me. :) We’ve found that sandwiches just don’t cut it for us – too expensive for our big eaters! Love to mix recipes up, like you said. Keeps life interesting and we all need that. If the recipe has something in it we don’t buy I try to sub in what we have on hand that is similar. Seeing the sweet potato streusel muffins on your menu reminds me I need to make some more of those. So good and I have a few sweet potatoes left from our CSA. I read about the instant oatmeal packets a while back and just didn’t grab onto the idea for some reason, but last week, I decided to give it a try. WOW! This is amazing. It is SO EASY to put together and easier still in the morning. We halved the recipe (in case it was not a hit) and after filling each little storage bowl, pulled out or dried fruits, cinnamon, nuts…My 10-year old son and I had so much fun combining flavors and popping our little bowls into the pantry. Next morning all we had to do was choose (that was the hardest part – so many great options), dump our mixture into a cereal bowl, and pour on our hot water. That was it! My little bowls are all empty now and I’ll be making more – this time the entire batch! :) Thanks for sharing!